Another great sandwich for poolside! All the elements of a caesar salad without the bowl and fork. I left my bagel untoasted, and made it a more filling meal by adding some chicken chunks. So good, so easy! 1. 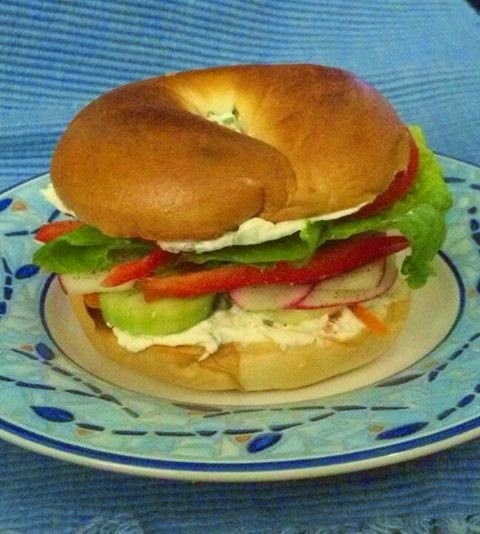 Spread dressing evenly on cut sides of bagels. Sprinkle with pepper. 2. Layer shredded cheese, onion, lettuce and chicken on one half of bagel, top with other half. Because Tim was indulging in some ribs for lunch, I got to choose a recipe from my stack that I wanted to try for myself. I took some liberties with this one based on what I had on hand and the rush I was in to eat lunch after being out most of the morning. I used some Cheddar Parmesan cheese bread from a local bakery for the base, toasted lightly. I had Perdue Honey Roasted Chicken chunks. I put them into a bowl and shredded them as best as I could. I didn't measure the ricotta or the jalapenos, just eyeballed it. Went a little too heavy on the ricotta, I was afraid of it drying out in the oven. Added both to the bowl, stirred it around and then put it in the microwave for about 35 seconds (our fridge is really cold and I wanted to make sure that everything was heated through in the end). 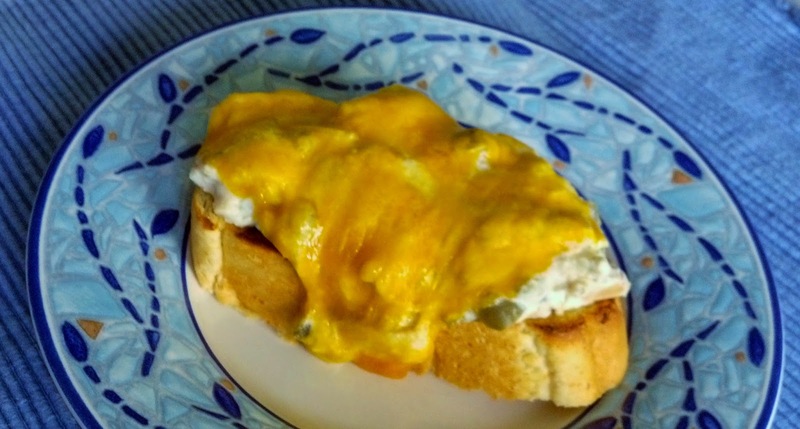 I scooped it onto the bread and then added a slice of Sargento Thin sliced Cheddar on each piece. Been spending a lot of time poolside at my parent's house since school got out. We pack the cooler with sandwiches and snacks and just hang out. After a month of lunch meat, I went searching for something different that was still simple to make and easy to transport. Right now there are always prepped veggies in my fridge for salad or snacking, so this came together very quickly. Since I'm the only jalapeno lover, I made up the total amount of cream cheese spread and put the rest of it in a specially marked container. I used 1/3 less fat cream cheese, and because I never have green onions when I need them, Penzey's dried chives. I think very thin slices of purple onion would be awesome on this too, or even zucchini and summer squash. Thank you to Cheri at Kitchen Simplicity for getting me out of my "same old, same old" sandwich rut! 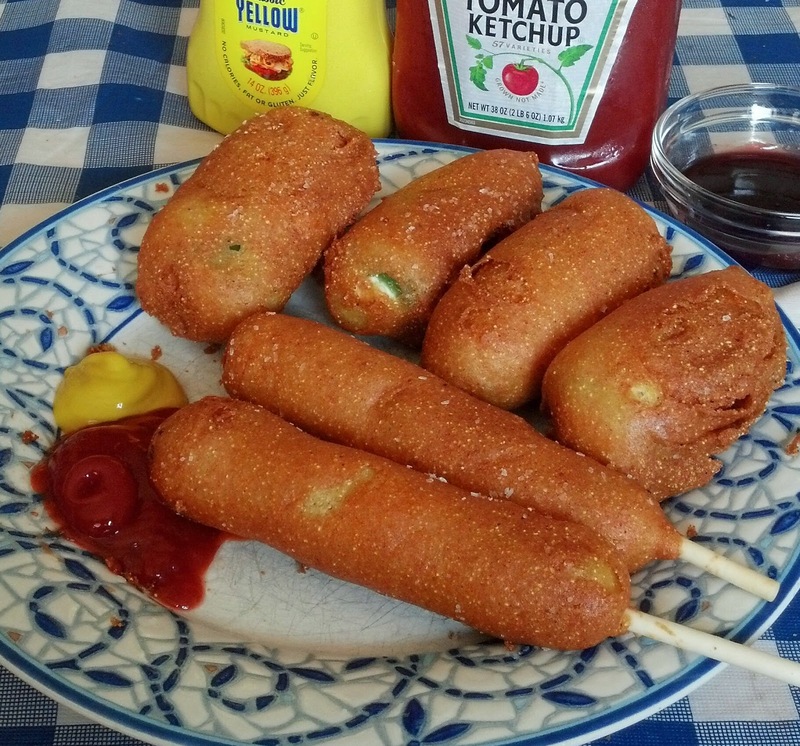 I don't fry very often, but the other night I had a craving for corn dogs. All day long, I tried to talk myself into these, but incredibly hot temperatures made turning on the oven not so desirable. Since I hadn't planned on frying, I just googled a few recipes, and came up with this one. For myself, I used Hebrew National 97% fat free dogs, and Oscar Mayer Beef Franks for the guys. I followed the recipe as given except I cut back on the chili powder to about 3/4 of a teaspoon. It all came together quickly, and Jake loved them. I found them to be a bit gritty and they puffed up to a huge size. I also did a few jalapenos stuffed with cream cheese, and those turned out gigantic as well. 3 teaspoons (which is a tablespoon) of baking powder seems like a lot... I'm not sure I'd ever make this particular recipe again, but if I did, I'd definitely play with the ratio of cornmeal and cut back that baking powder amount. Brats. We eat a lot of them in the summer. Also hot dogs, kielbasa, Italian sausages. They can get monotonous after a while. 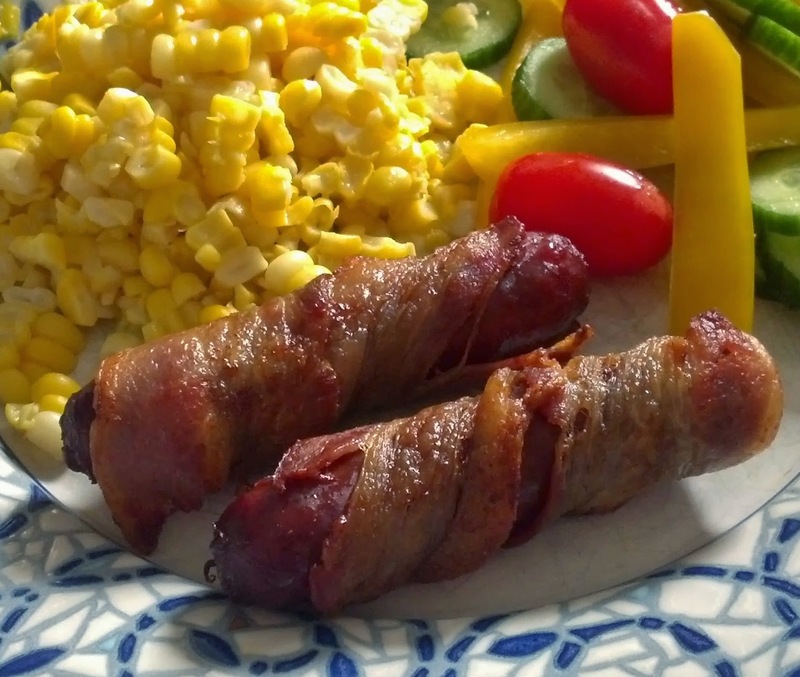 I've done the Brat Hot tub before, and I've made bacon wrapped hot dogs before, and this recipe seemed like a great combination of the two ideas. I added a bit of maple sugar to the liquid mixture. We went straight dijon mustard as a dipping sauce.